Incompressible Stokes flow with Navier (slip) boundary conditions, flow driven by a moving wall and a small diffusion for stabilization. This example demonstrates a weak application of no-penetration boundary conditions using the penalty term dw_non_penetration_p. where is the fluid viscosity, is the slip coefficient, is the (small) numerical diffusion coefficient, is the penalty coefficient (sufficiently large), is the top wall that moves with the given driving velocity and are the remaining walls. The Navier conditions are in effect on both , and are expressed by the corresponding integrals in the equations above. 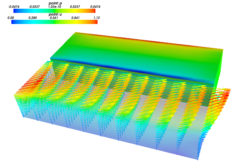 The no-penetration boundary conditions are applied on , . Optionally, Dirichlet boundary conditions can be applied on the inlet, see the code below. The mesh is created by gen_block_mesh() function - try different mesh dimensions and resolutions below. For large meshes use the 'ls_i' linear solver - PETSc + petsc4py is needed in that case. by a moving wall and a small diffusion for stabilization. conditions using the penalty term ``dw_non_penetration_p``. expressed by the corresponding integrals in the equations above. the inlet, see the code below. solver - PETSc + petsc4py is needed in that case. # Try setting the inlet velocity by un-commenting the 'inlet' ebcs. 'eps_d' : 1e10, # Divergence tolerance.